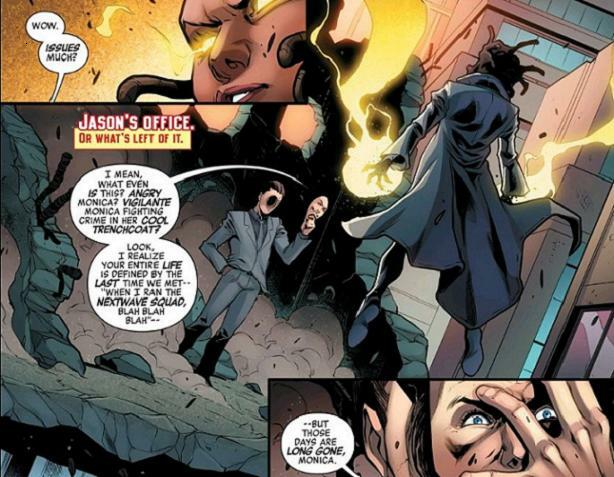 Writer Al Ewing’s ongoing rivalry between the Mighty Avengers and Cortex Incorporated’s CEO, Jason Quantrell, reaches its conclusion this week. As much as the story provides a tangible throughline from the decade-old work of Warren Ellis to the now-unfolding master plan of Jonathan Hickman, it does very little else of its own merit. Uh, her name is “Rambeau”. Duh! It’s almost as if Ewing has given up trying to write his own original material. Secret Wars is just around the corner and it’s common knowledge that it’s the terminus of all current Marvel books. Bearing this in mind, Ewing appears far more interested in paying lip service for twenty pages than carving his own respectable niche. Internally, the current installment also shows weakness, offering little of value removed from greater context. For readers coming into this issue cold, in and of itself, there’s just not a tremendous amount to dig into. Here and there, though, there are moments throughout the issue that are genuinely enjoyable. On several occasions, Ewing demonstrates some facility of the classic Spider-Man nervous string of one-liners. The “throwing up in the mask” bit is a somewhat tired riff yet something every writer can’t resist taking a crack at. Results will vary. Surface-handling of Spidey aside, there’s a very distinct subset of characters in Ewing’s cast that he seems to have the deepest affinity. 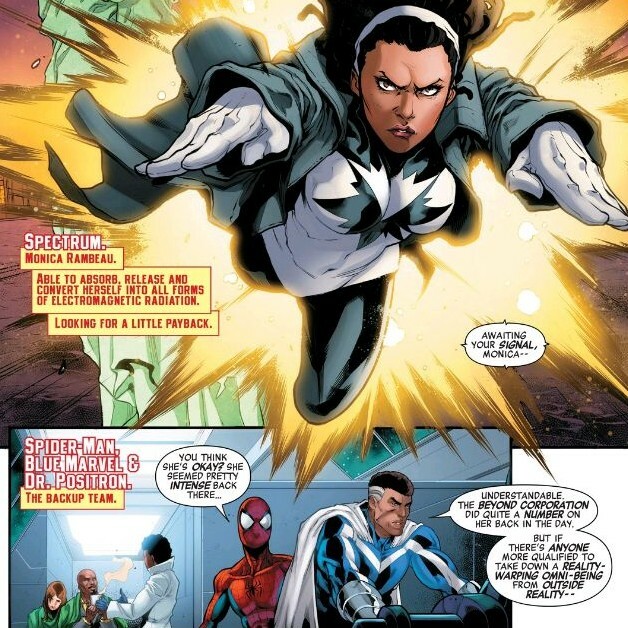 As lead in the “A” plot, Monica Rambeau (Spectrum/Photon/80s Captain Marvel) is already something of a long-standing cult fave. Add in her presence from the equally-cultish Nextwave and it is clear that Ewing is card-carrying with both societies. This isn’t a bad thing by a long shot- kudos just for attempting the reconciliation of the Agents of H.A.T.E. with mainstream continuity but heart-on-the-sleeve fanboyishness only takes it so far. The other party is Blue Marvel and, by extent, his family. As an African American Superman analogue retroactively inserted into Marvel’s history, the character continues to overflow with story possibilities. Ewing uses Dr. Brashear well as the silent backbone of both volumes but really pushes him to the forefront not only for the issue but overall. First, there is the implication of a slow-burning “thing” between the Marvels, both Captain and Blue. Seeing this blossom a little bit more in the upcoming “Last Days” arc would be nice. Then there’s his mad science skills and the fact that he orchestrated the “street” Avengers taking down a Beyonder! Granted, it may not have been a pure version like Thor and company face down out in the wilds of the multiverse- but still, this is a guy Richards and T’challa should be comparing notes with post-haste! 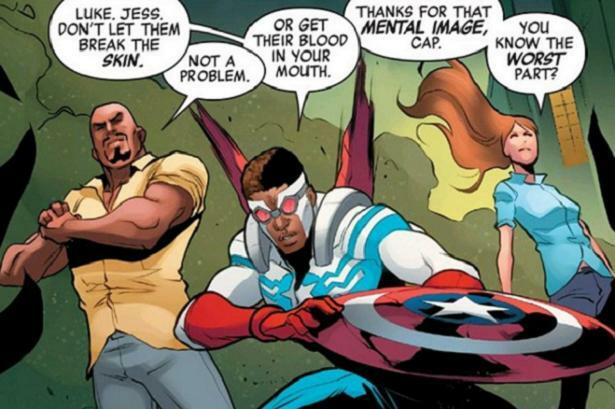 Former Falcon, Sam Wilson, also gets a couple of moments to finally justify why Captain America’s name is above the team’s in title. 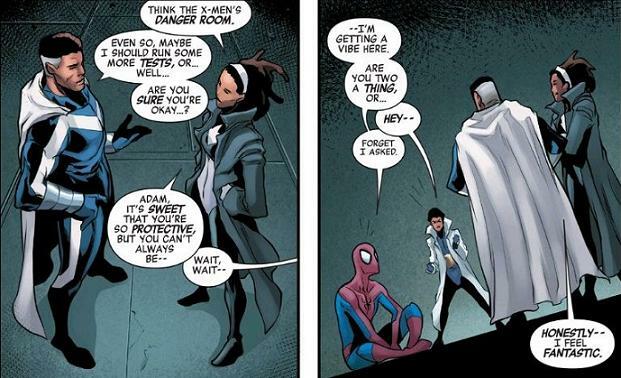 Since taking over the mantle under the bizarre cloud of Avengers & X-Men: Axis, Sam’s had a rough time of living up to expectation. Although only appearing in roughly one-third of the issue, he does more to assert why he’s the right guy for the job here than he’s done in all previous issues combined. On the plus side, the art is pretty solid. Artist Leinil Yu and colorist Matt Milla turn in a haunting cover, that is also dark, moody and ominous. There’s real stakes inside as well, no question, but it just doesn’t have the weight this cover possesses. Semi-regular series artist Iban Coello handles the interiors with color artist Rachelle Rosenberg. Normally alternating with veteran Luke Ross, Coello turns in work dancing the borders between “cartoony” and “standard comic book”. As a relatively new talent, he already demonstrates a firm escalation of chops and an admirable sense of pacing and panel layout. This issue isn’t a flashy breakout of talent, per se, but sometimes the most noticeable move is to just quietly keep a steady hand on the tiller. There is one major art/script disconnect, though. 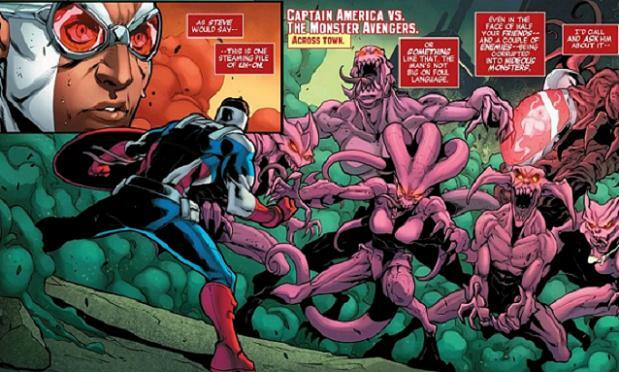 In addition to not being able to easily discern who’s who of the temporarily-mutated and “monster-ized” Avengers, the stand-off simply ends without any on-panel explanation or depiction. One minute, FalCap and the Cages are trying not to hurt or get hurt by their transformed teammates. The next, everybody’s back to normal with the real villain nowhere to be seen! It’s sort of a stretch of implication that this ties directly to Spidey and the Marvels taking down Beyonder-Quantrell across town simultaneously as it’s not spelled out by any means. It’s almost as if there’s an entire page-worth of transition/exposition missing in-between. The Mighty Avengers: Combing through your longboxes. “Kick ‘Splode” isn’t an overly satisfying ending to a long-standing plotline but it is an ending all the same. However, it’s a fine collection of footnotes and maybe does more to raise a question or two. If you’re a fan of Nextwave and/or Hickman’s Avengers saga, it may be worth the once-over. Hopefully Ewing’s saving up what he really wants to say for the Mighty Avengers’ upcoming finale. 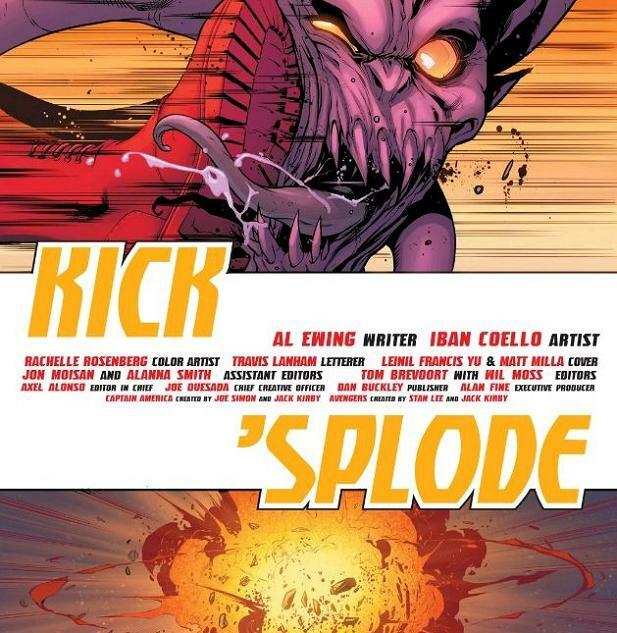 “Kick ‘Splode” isn’t an overly satisfying ending to a long-standing plotline but it is an ending all the same. However, it’s a fine collection of footnotes and maybe does more to raise a question or two. If you’re a fan of Nextwave and/or Hickman’s Avengers saga, it may be worth the once-over.